Help Demi Lovato see my #TMYLMcover?! Hey #Heartbreakers! I just uploaded my cover of Demi Lovato's song "Tell Me You Love Me" to YouTube and Instagram. Demi is holding the #TMYLMcover Contest and I would L-O-V-E for her to see my video! She has been a huge inspiration to me over the past 10+ years! From watching her rock out as Mitchie Torres in Camp Rock back in 2008 (you can read more about that here!) to seeing her in concert throughout the years and of course, covering her songs at so many of my performances, she has (unknowingly to her!) been a HUGE part of my life and musical journey! 1. YouTube: Watch my "Tell Me You Love Me" cover on YouTube and leave a like and/or comment! (it will help more people on YouTube find my video!) -- Click HERE to watch on YouTube! 2. 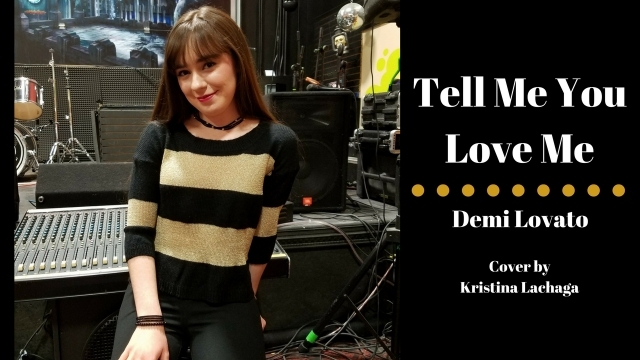 Share on Socials: Share my the YouTube link to my cover on social media with the hashtag #TMYLMcover and tag Demi Lovato (@ddlovato) and @KristinaLachaga -- I will TOTALLY share/retweet your post, just let me know it's there by tagging me! 3. Instagram: Watch and like my cover on my Instagram (@KristinaLachaga) and tag @ddlovato in the comments! -- Click HERE to watch on Instagram! P.S. Huge thank you for helping to get my #TMYLMcover on Instagram to over 2,000 views in less than 24 hours! That was CRAZY.